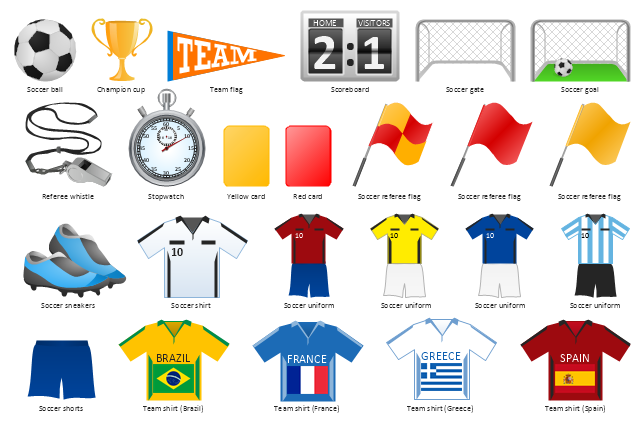 The vector stencils library "Football (Soccer)" contains 24 association football clipart images. "Association football, commonly known as football or soccer, is a sport played between two teams of eleven players with a spherical ball. It is played by 250 million players in over 200 countries, making it the world's most popular sport. The game is played on a rectangular field with a goal at each end. The object of the game is to score by using any part of the body besides the arms and hands to get the football into the opposing goal. The clip art example "Design elements - Football (Soccer)" was created using the ConceptDraw PRO diagramming and vector drawing software extended with the Soccer solution from the Sport area of ConceptDraw Solution Park. Basketball is a popular sport played by two teams of five players with a ball. 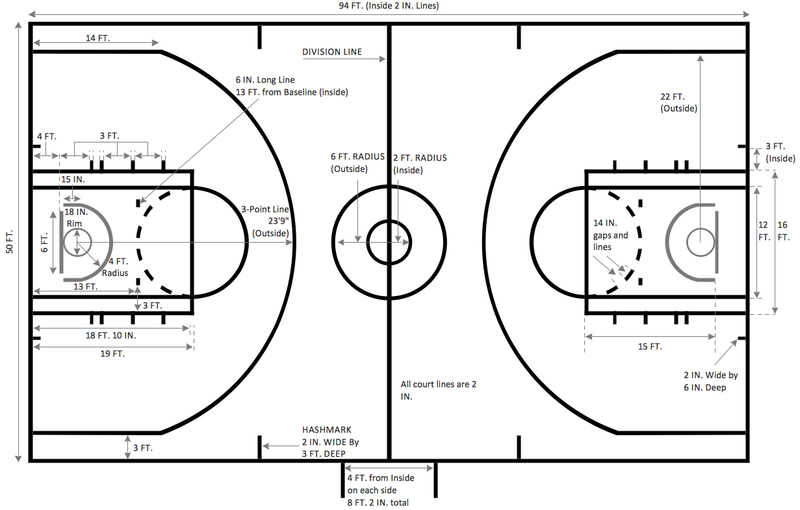 The game takes place on a rectangular court. 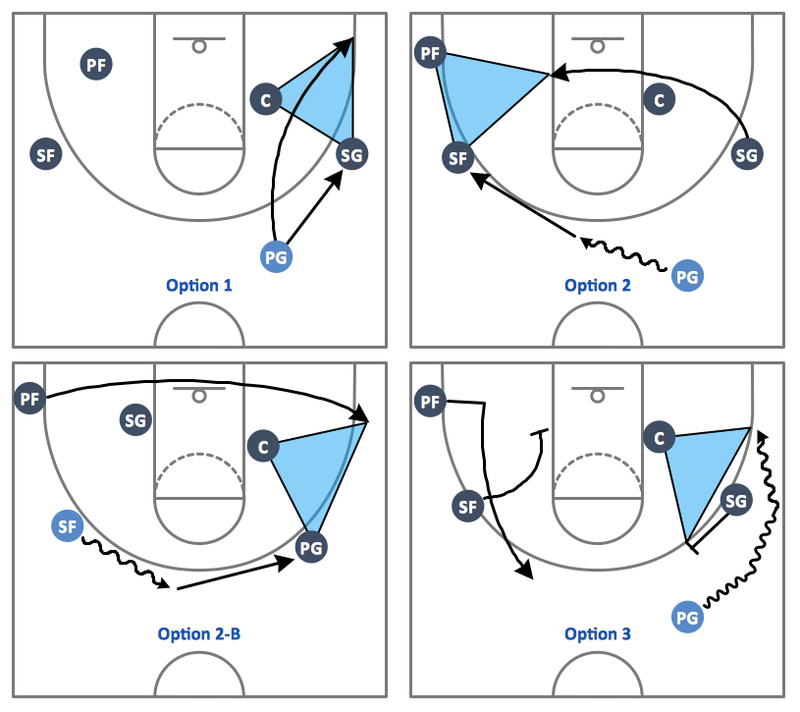 The team goal is to score a ball into the basket of the opponent team. The team with the most points wins the game. (1) In one's own half the aim of a throw-in may be to retain possession in order to build up the next attack. The throw may or may not go toward the opponents' goal; the most unmarked player may be a full-back who is behind the ball. Such a throw followed by a quickly taken 'switch' pass can be an effective tactic. Under pressure however, the ball is often thrown up the line, toward the opponents' goal line to gain as much ground as possible. (2) If the thrower is unmarked, a simple tactic is to take a short throw to the feet or chest of a marked player who immediately returns the ball to the thrower. A goal kick is an important 'set piece' that will occur many times in a game and yet few teams practice it. If taken quickly the kick may be taken short to a full-back who has run into a wide position. Although this may gain little ground it retains the all-important possession of the ball. A longer kick to the midfield is more common and it is vital that the midfield unit are in a position to receive it. A corner kick (or "corner") is a real goal scoring opportunity and it is essential to know who is the best at taking a good corner from both the left and right side of the pitch. A good corner will be aimed high across the goal and may be 'bent' towards or away from the goal. At least one of the forwards should be on or close to the goal line when the kick is taken. 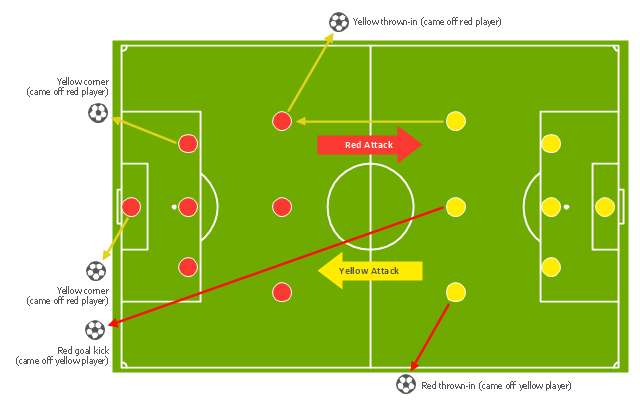 The diagram example "Association football (soccer) - The pitch: throw-ins, goal kicks, corners" was created using the ConceptDraw PRO diagramming and vector drawing software extended with the Football solution from the Sport area of ConceptDraw Solution Park. 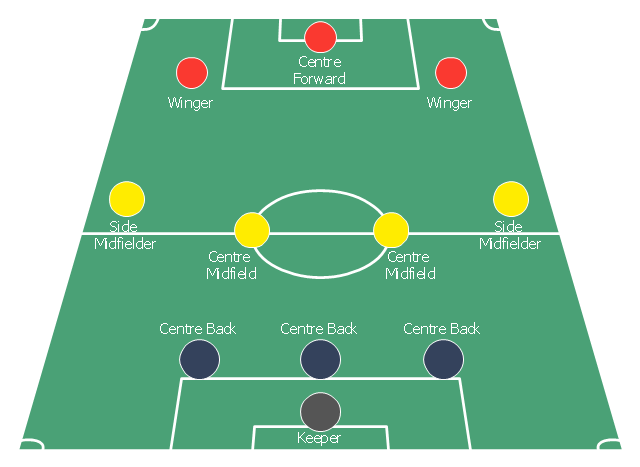 The diagram example "Association football (soccer) formation 3-4-3" was created using the ConceptDraw PRO diagramming and vector drawing software extended with the Football solution from the Sport area of ConceptDraw Solution Park.